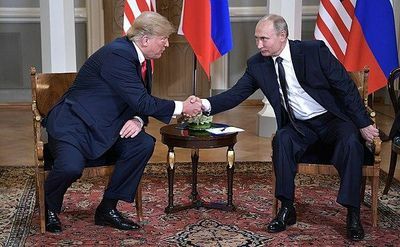 The 2018 Russia–United States summit was a summit meeting between United States President Donald Trump and Russian President Vladimir Putin on July 16, 2018, in Helsinki, Finland. The Finnish Ministry for Foreign Affairs officially titled the summit as the #HELSINKI2018 Meeting and it was hosted by the President of Finland Sauli Niinistö. During a post-summit joint press conference with Putin, Trump did not accept Russian interference in the 2016 U.S. elections. Trump's omissions provoked an uproar across the political spectrum, including from some of his usual allies. One day later, Trump amended part of his remarks, contending that he had misspoken due to an incorrectly perceived "double-negative".